Model 1500 is Feedall’s feed systems for pucks and slugs. The 1500 is extremely flexible and capable of feeding a wide range of parts. Unlike traditional parts feeders, this feed system can handle tubular/solid slugs and pucks in the same feed system. The parts are handled gently with no part fallback. Feeds parts from a random loaded floor mounted hopper. The parts are then be metered from a vibratory hopper on demand and spilled at random onto a bi-directional feed conveyor. 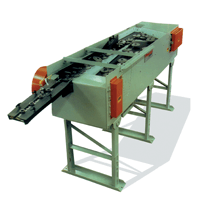 The parts merge from the infeed conveyor lane onto the orienting conveyor lane and exit in a continuous end-to-end stream to an automatic, air operated slug pusher device. The pusher device loads one slug at a time into an air-operated rotary actuator equipped with a pneumatic gripper. The rotary actuator will present the slug with axis vertical with the bottom of the slug.